French President Francois Hollande (R) shakes hands with Britain's Prime Minister David Cameron during a joint news conference Nov. 23, 2015, at the Elysee Palace in Paris. British Prime Minister David Cameron offered France new assistance Monday for its airstrikes against Islamic State insurgents in Syria and said he would ask the British parliament later in the week for approval to join the fight against the jihadists. In a visit to Paris, the British leader told French President Francois Hollande that French jet fighters could use a British airbase in Cyprus to launch their attacks on Islamic State targets and also offered air-to-air refueling services. "I firmly support the action that President Hollande has taken to strike ISIL in Syria and it is my firm conviction that Britain should do so, too," Cameron said, using an acronym for Islamic State. Britain is already bombing Islamic State positions in Iraq. 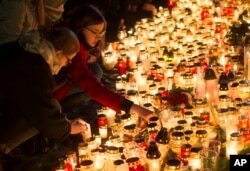 FILE - Candles are placed outside the French embassy in Vilnius, Lithuania, for the victims in Friday's attacks in Paris, Nov. 14, 2015. France is intensifying its attacks on Islamic State targets in Syria in the aftermath of the deadly Paris attacks that killed at least 130 people and wounded more than 300 others. Paris moved its sole aircraft carrier, the Charles de Gaulle, into position in the Mediterranean on Monday and could use the Cyprus base as an alternate launch base. Hollande is embarking on a round of high-level talks with world leaders, seeking to enlist their support in a coordinated attack on the militants. He is headed to Washington for a strategy session Tuesday with U.S. President Barack Obama and later in the week to Moscow for a meeting with Russian President Vladimir Putin. Hollande is also meeting with German Chancellor Angela Merkel and Italian Prime Minister Matteo Renzi. The White House said Obama and Hollande will discuss "further cooperation" as part of the U.S.-led coalition that has been conducting airstrikes against Islamic State targets in Iraq and Syria for more than a year. French warplanes have been part of that effort, and officials said the desire for greater action does not include expanding the operation to include ground troops into Syria. 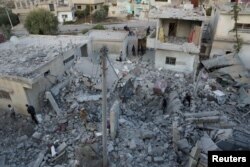 Hollande said Monday his military will "intensify" its Syria strikes. France sponsored a U.N. Security Council resolution passed last week that urges all able countries to work to "prevent and suppress terrorist acts" by Islamic State and other groups, and to "eradicate the safe haven" they have carved out in eastern Syria and northern and western sections of Iraq. The measure, which condemns Islamic State attacks this year in France, Egypt, Tunisia and Lebanon, says the militants represent a "global and unprecedented threat to international peace and security." FILE - Residents inspect a damaged site from what activists said were airstrikes carried out by the Russian air force in Nawa city, Deraa, Syria, Nov. 21, 2015. Russia has been bombing in Syria for nearly two months, but its campaign has faced criticism from Western governments that say the strikes have focused on rebels opposed to Syrian President Bashar al-Assad and not the Islamic State group. In recent days, however, since Russia concluded that terrorists downed a Russian passenger jet last month over Egypt's Sinai Peninsula, Moscow has bombed Raqqa, the self-proclaimed Islamic State capital in northern Syria. Obama said Sunday that he thinks the bombing of the Russian plane is leading to an increasing awareness on Putin's part that the Islamic State group is Russia's biggest threat in the Middle East.